A dual network strategy for cycling only makes sense if we have a bimodal population of cyclists. To illustrate this, consider Frideswide Square, where the planners are clearly picturing something like this. Now this may reflect the distribution of actual cyclists in many parts of the UK, but it doesn't reflect Oxford cyclists and it doesn't reflect potential cyclists anywhere. 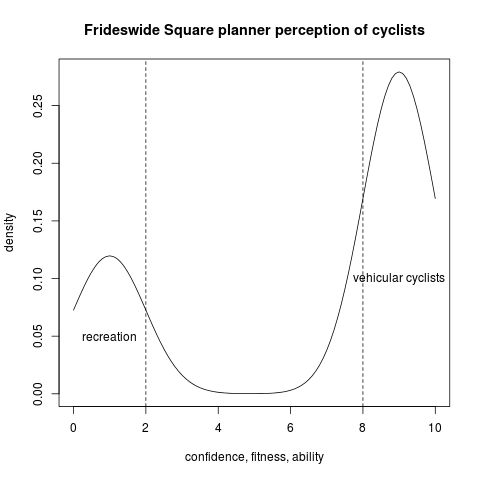 The reality is that potential cyclists anywhere must follow at least a vaguely normal distribution in confidence and ability. And in Oxford, the bulk of actual cyclists are not vehicular — observation suggests the vast majority won't ever take primary position — but neither are they recreational cyclists happy to take roundabout routes barely faster than walking pace. Most are commuters and shoppers, with a preferred cycling speed around maybe 10mph. I estimate, from talking to friends and acquaintances, that while half of current Oxford cyclists (A) are pretty happy, the other half (B) are only cycling on limited routes, or are cycling uncomfortably and nervously. If we're going to double the number of cycle trips made, we need not only to make the people in B happier about cycling more routes, we need to reach people in C who aren't cycling at all at the moment, or only on the occasional Sunday. We need routes that are safe for the slower and less confident, but which at the same time don't annoy or unnecessarily slow down faster cyclists. The key locations for improvements, in my opinion, should be the choke points which are unavoidable — the Plain, Warneford Lane, and Frideswide Square among others. So I think the council has done the right thing in picking two of those for attention. The problem is that they have taken the wrong approach: these locations need cycling infrastructure engineered with the people in B and C in mind, not for the people in group A with a half-hearted gesture to those in group D. And that means providing a separate space for cycling, not offering people on bicycles a choice between pretending to be motor vehicles and pretending to be pedestrians, between "taking the roundabout" in front of buses and pushing their bikes on the footpath (the alternative at the Plain). I come back to Oxford now and again. It's sad to see them spend so much money to build something as wrong as St. Frideswide Square. There was ample room to build segregated cycle, pedestrian and motor routes but the new design deliberately creates conflict between road users. What a wasted opportunity. "suggests most won't ever take primary position"
My experience of taking primary when I judge it appropriate - including into town down some stretches of Cowley Road, and West off Frideswide under the railway bridge, is that not only do you have to deal with the perennial problem of motorists not understanding that what you're doing is logical and legal, but unless you are going absolutely full pelt (which isn't always safe) then in Oxford you also have to deal with other cyclists taking this as an indication that they should pass you on the inside.